Celebrate National Soup Month With These Easy Cheesy Idahoan® Steakhouse® Soup Bowls. Did you know that January is National Soup Month? Don’t feel bad, I didn’t either, until now! 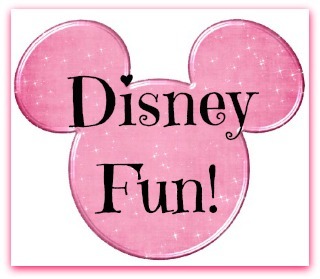 It makes sense, though, with all of the cold weather, which is perfect for your favorite hearty soup! Are you looking for a great, easy dinner for your family that everyone will love? You have to try Idahoan Steakhouse Soups, they are amazing! We get sick of frozen pizza and fast food cheeseburgers during the week, but sometimes that seems like the only thing I have time to prepare after a day of working and school. I love to meal prep and often have meals for the coming week prepared over the weekend, but there are still many times when we don’t have meals prepared or there is an unexpected practice or game we have to get to. I have made Idahoan potatoes throughout the years and love the quality and taste they bring to the table (pun intended). When I saw they had potato soup, I just could not pass it up! My homemade potato soup is a staple around our house, so I knew Idahoan® Steakhouse® Soup would have to be great for my family to like it. When the soup packages arrived at our house and I saw the prep time was less than 20 minutes, I was more than a little skeptical. All I had to do was add boiling water and, VOILA! We had one of the most hearty and amazing potato soups we have ever had. My feelings may have been a little fragile when my kids came back for seconds, but that feeling quickly changed when I realized how quick and easy dinner was going to be! 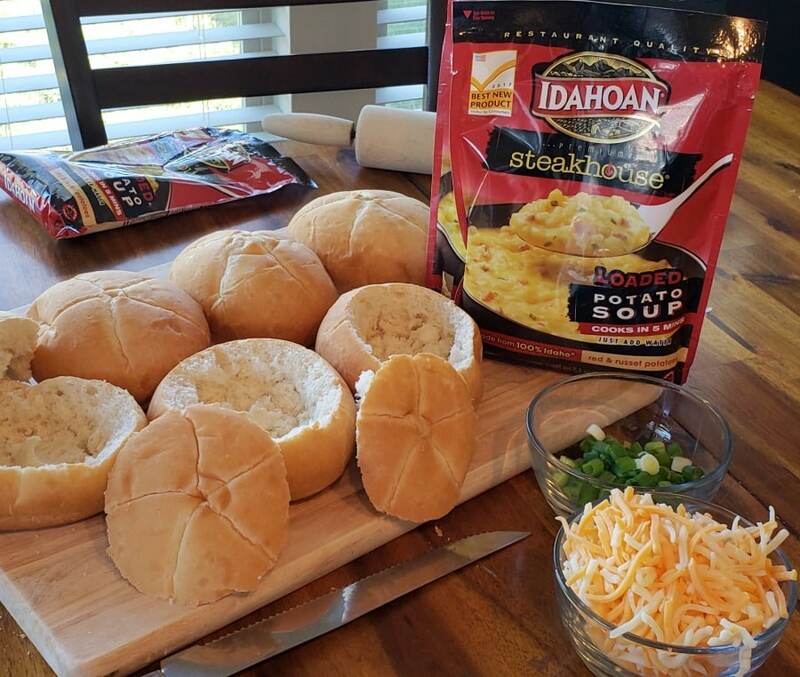 Idahoan Steakhouse® Soups bring together real Idaho® potatoes with flavorful seasonings and rich cheeses to provide a creamy, hearty taste in every spoonful and all I had to do is add water. We are getting ready for the big game and cold weather, which always makes a great, thick, hearty soup the perfect addition to our weekends. I love to shop in the bakery section of my favorite grocery stores for their newest and tastiest breads. I bought some rolls and decided to try them out as bread bowls for our potato soup. A great way to make your bread bowls a little more sturdy for holding soups is to sprinkle the inside with cheese and bake them for a few minutes. For these bread bowls, I used Monterey Jack cheese and baked them at 450 degrees for 5 minutes. 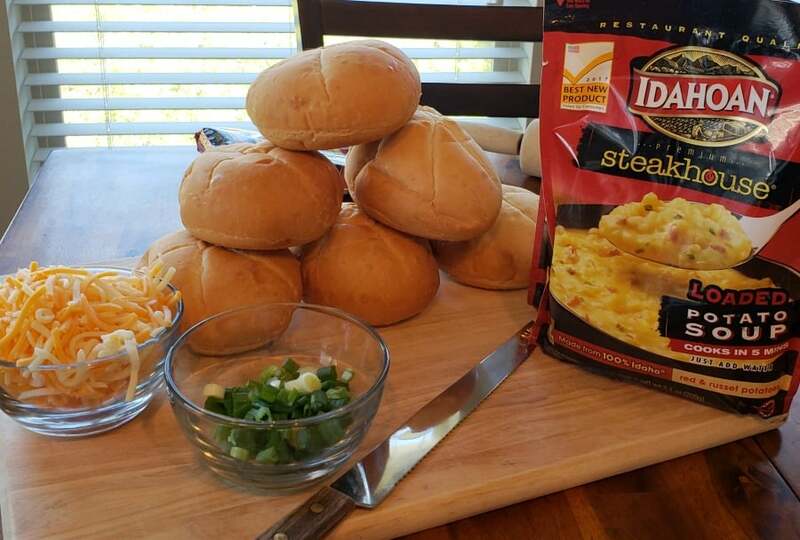 This adds a great flavor and gives the bread an added layer of strength for holding your Idahoan Steakhouse® Soup! Celebrate National Soup month with flavor and style. 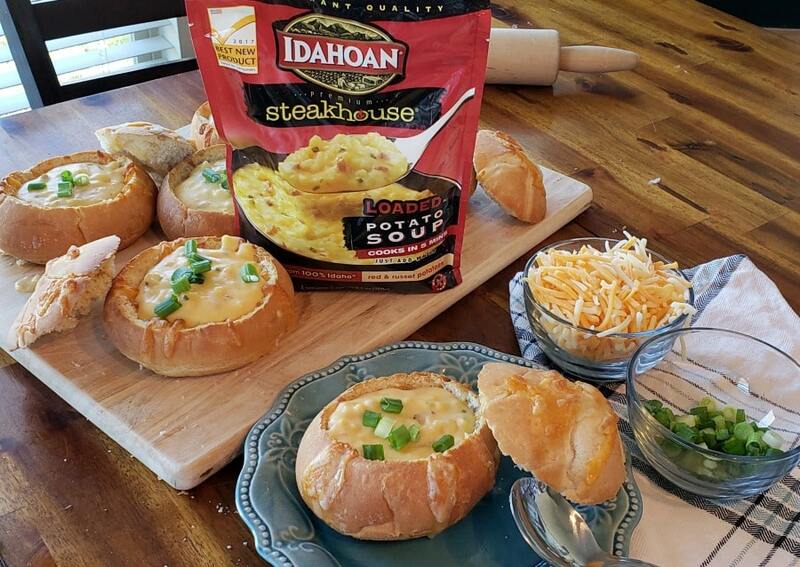 Impress your friends and family with these individual Idahoan Steakhouse® Soup bread bowls. You can even use smaller rolls and make finger foods for the appetizer table. Get creative and know that you can have a deliciously stunning meal in under 20 minutes!